Let ABC be a triangle with incenter I. 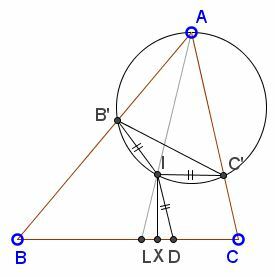 Let AI meet BC at L, and let X be the contact point of the incircle with the line BC. If D is the reflection of L on X, we construct B' and C' as the reflections of D with respect to lines BI and CI, respectively. 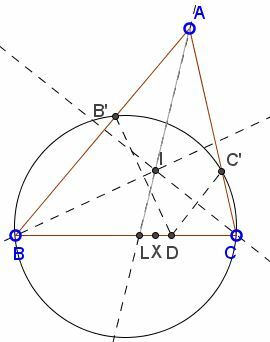 Show that the quadrilateral BCC'B' is cyclic. ∠ALB = 180° - α/2 - β = γ + α/2. ∠IDB = 180° - (γ + α/2) = β + α. ∠AC'I = ∠IDB = β + α/2. It follows that ∠AB'I + ∠AC'I = α + β + γ = 180°, making quadrilateral AB'IC' cyclic. ∠IB'C' = ∠IC'B' = α/2. ∠AB'C' = ∠AB'I - ∠IB'C' = (γ + α/2) - α/2 = γ. Similarly, ∠AC'B' = β which makes the line B'C' antiparallel to BC. As we know, this implies that quadrilateral BCC'B' is cyclic.